Lulu is abandoned in the outskirts when she was 5 months old, she has had scabies insects and her hair is few. A feeder found her then caught her to vet hospital to scan microchip then found her owner. The owner said he adopted her from an animal shelter but she is lost a week ago, so we asked owner to take her back, but he doesn't want Lulu anymore and refused to take Lulu back. We can sue him but Lulu will be sent to animal shelter again where kills animal by enthanasia, so we asked for tranfer Lulu to be ours, so we take on the responsibility of finding a happy forever home for her. We sent her to foster home after her skin illness is recovered. Lulu is intelligent but also shy. She starts to be a sweetie after 4 days in foster home. 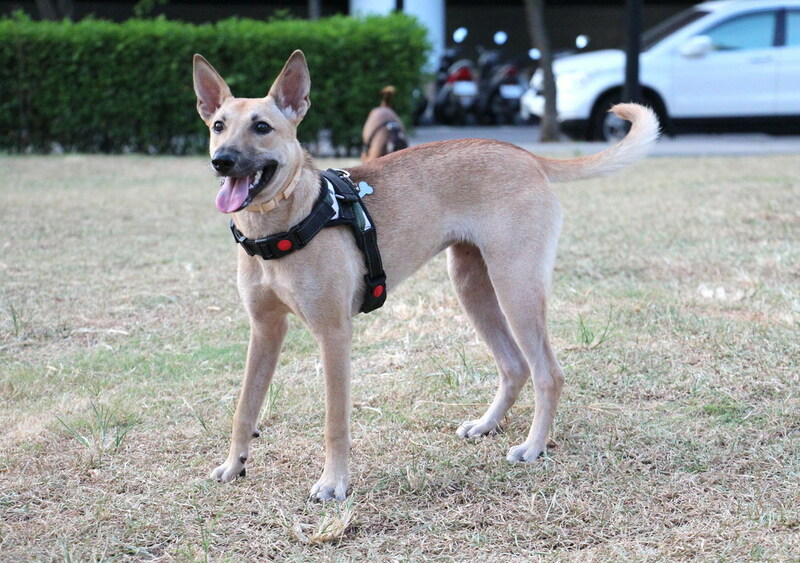 Even though she is shy but still friendly and sweet-temperament to foster family. She is learned skill quickly and follows commands well. She has good behaviors, no barking issue when she is alone, and she pees and poos at outside only by three times a day goes out. She is not enjoyed to be petted by strangers but still be friendly with them. She is playful with dogs in public place, and good with cats. She loves to be petted in home. She likes to play fetch. She does not like to chew furniture, she loves to play with dogs in home too but if there is no playmate then she plays toys alone. Comments: Lulu has high energy, she is a teenager dog. She gets a little shy with strangers but is still friendly.